Metrax Engineering manufactures a wide variety of Shelving Units, Bench Units, Drawer Units, Cabinet Units and Case Units for use in Vans. 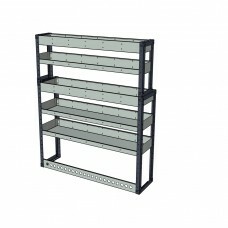 Buy our shelving units flat packed from our website, or contact our helpfull staff to discuss options for your vehicle. Metrax also offers Complete Van Packages which are made up of a selection of units tailored to suit your particular vehicle. Standard units are constructed from cold rolled steel. 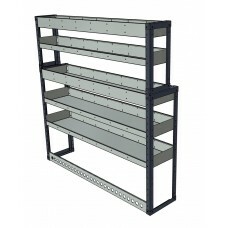 Endframes are powder coated in textured RAL7016 grey / shelves bright zinc galvanized. Open endframes mean these units are superlight and when placed together, the space available can be used for carrying pipes / tubes etc. 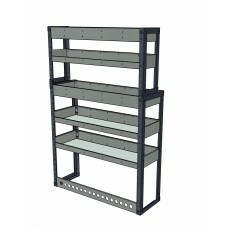 Shelves are fully adjustable using high tensile 8mm fixings. Single units are supplied flat packed with fixings and instructions for easy assembly / installation. Build time approx 20 minutes using minimal tools. Single units are generally shipped flat packed. Orders of two or more units are usually shipped assembled. Full range of accessories available to suit all shelving unts, including rubber matting, bins, bottle holders and perforated end panels. Metrax Engineering can also design and manufacture bespoke or custum made interiors to suit any vehicle or any fleet of vehicles.